Sitting here listening to some great tracks like Caravan or Whiplash from this weeks Film Club screening at the Robert Burns Centre Film Theatre, its difficult not to describe Whiplash (2014) as a jazz themed film for lovers of that musical genre, but its much more than that and certainly would appeal to those in the audience that would describe themselves as jazz fans. Its real theme is a very disturbing relationship that builds up between an ambitious young student Andrew Neiman and an abusive potty-mouthed music instructor Terrance Fletcher. Introduced by Rachel Findlay who gave the large attentive audience some interesting background to the film. 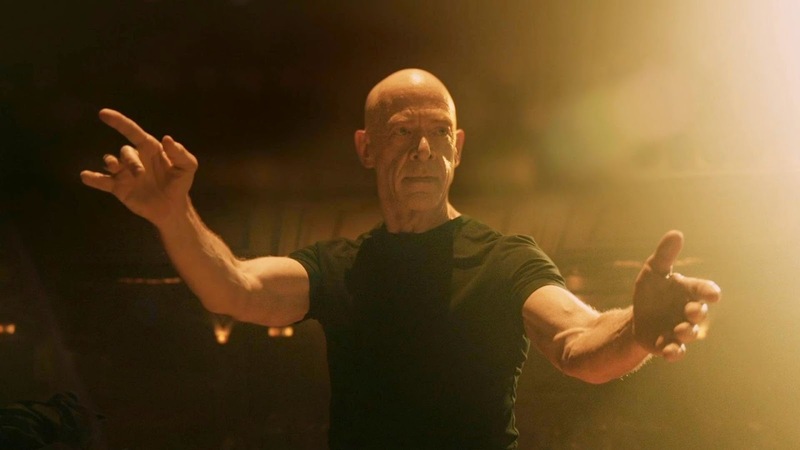 It had, she said, received some excellent reviews along with plenty of accolades including three Academy Awards, including Best Supporting Actor for J K Simmons for his role as Fletcher, Best Film Editing and one that will come as no surprise to those of you who have seen the movie, Best Sound Editing. Written and directed by David Chazelle whose debut film was a jazz musical which was a unique mixture of live jazz and choreographed tap dancing! 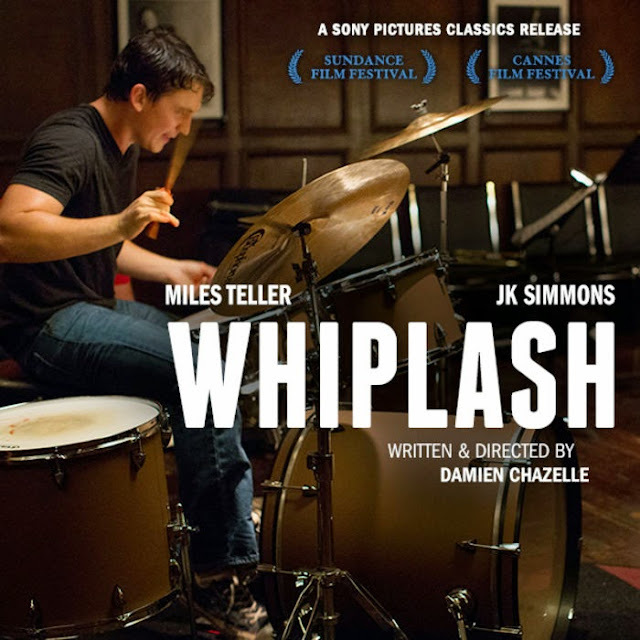 Whiplash is his second film and drew on the director’s experience while attending Princeton High School where he was part of a very competitive jazz band that managed, just like his young protagonist, to injected him with a feeling of dread. He based the role of Fletcher on his own band instructor but admitted he pushed it further giving J. K. Simmons instructions that "I want you to take it past what you think the normal limit would be", telling him: "I don't want to see a human being on-screen anymore. I want to see a monster, a gargoyle, an animal" as well as adding in characterisations of other notorious bandleaders like Buddy Rich. A friendly chat - I suspect not? Rachel went on to tell us that it originally took 10 days to write the 85 page draft script with Chazelle spending a further two years polishing it until he turned 15 pages of the script into a 18 minute short film which was successfully screened at the 2013 Sundance Film Festival attracting the investment that allowed the full length feature film to be made. It was shot over an 18-day period with cast and crew working 14-hour days. Although the film was set in New York City it was actually filmed in Los Angeles. 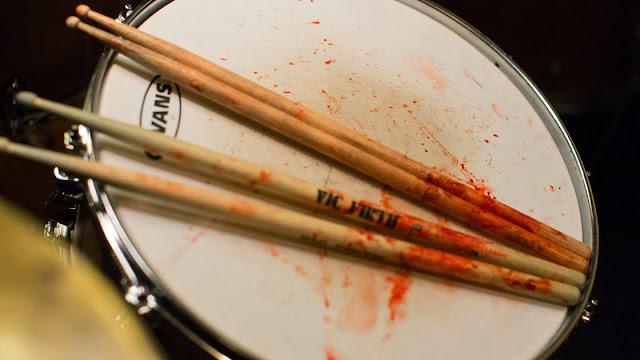 Rachel explained that many of the band members seen in the movie were actual players or music students with the director deliberately attempting to capture moments of fear and terror from them that allowed for a more realistic feel to the films band rehearsals. 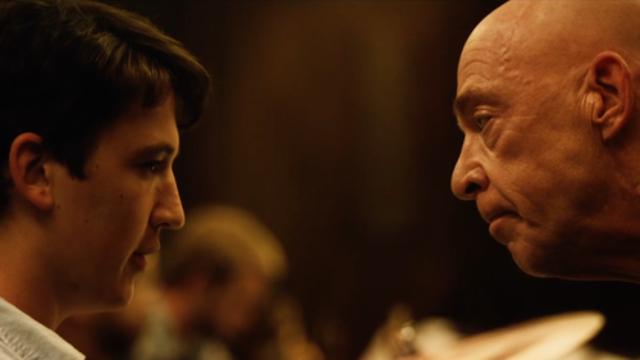 "Now take your time from me"
This movie is made especially dynamic by the power struggle between the two main protagonists Fletcher and Andrew Neiman, portrayed by Miles Teller a young Elvis look-a-like whose debut film was opposite Nicole Kidman’s playing her young admirer in Rabbit Hole (2010), and throws up the question whether Fletchers teaching methods are tantamount to abuse by an older man onto a young impressionable student put in his care though the education system or if the old adage is correct it you can’t do it: teach it. Perhaps Fletcher demands fame through proxy, and does he know the difference between ambition and obsession? For the viewer this movie is an exhausting watch and at time’s a horrific one but this adds to the movies dynamic force and one which breaths tension. You may, like me, love the music and enjoy the brilliant musical action scenes, but by the end of this movie you’re need to work out where your sympathies lie - somewhere, I guess between determination and fixation?